Okay, I know I’ve said on Twitter and what not that I would stop complaining about the weather. I do realize how fortunate I am not to be dealing with hurricanes, monsoons, or tornadoes. That said, this spring has been bizarre. All over Europe it’s cold and raining. The sun poked out for a few minutes the other day. It was still cold. The locals were wearing jackets and many tourists were in shorts. My friend Annie finally had a few free minutes in her schedule and happened to be downtown/in the Historic Center. I was in between meetings. We went to Ciampini for a long overdue catch up session. This little dessert was perfect. 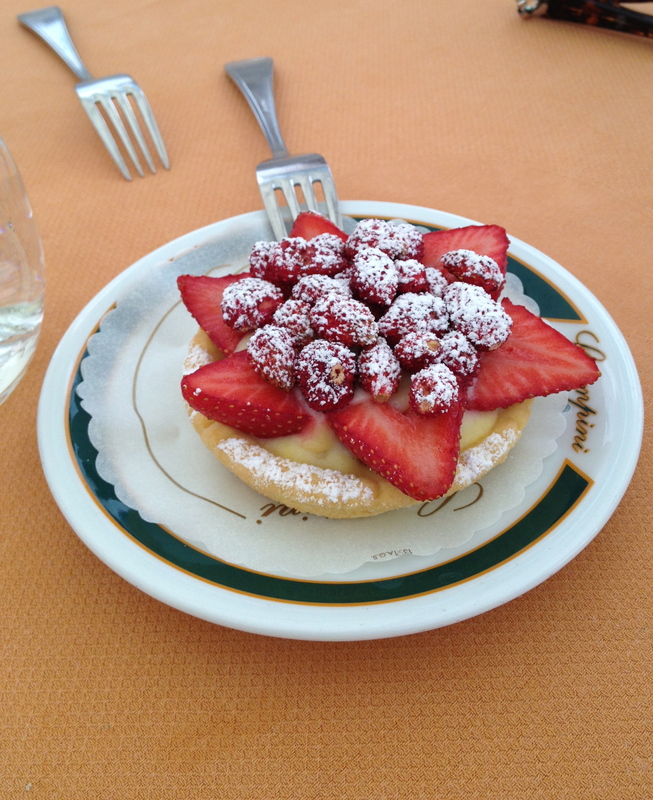 As I bit into the tart, gale force winds whipped around the piazza. Clearly, spring is wrap, but summer is (hopefully) right around the corner. Hopefully the next ten days will be the last of the cold/wet/windy weather. Of course in a few weeks many of us will complain it’s too hot! Grazie e Buon Weekend a te! I just love how you always use the term “it’s a wrap” — you can take the girl out of Hollywood, but you can’t take the Hollywood out of the girl! Buon weekend bellissima!!! I’ve never noticed that. I’m trying to refrain from saying, “at the end of the day” all the time. Grazie e buon weekend a te cara!! It was. It looks bigger in the photo. It’s tiny. A few delicious bite and it’s all gone.